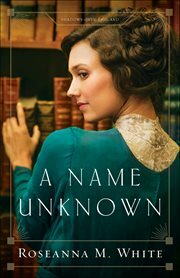 The item A name unknown, Roseanna M. White, (ebook) represents a specific, individual, material embodiment of a distinct intellectual or artistic creation found in Charlotte Mecklenburg Library. Rosemary Gresham has no family beyond the band of former urchins that helped her survive as a girl in the mean streets of London. Grown now, they concentrate on stealing high-value items and have learned how to blend into upper-class society. But when Rosemary must determine whether a certain wealthy gentleman is loyal to Britain or to Germany, she is in for the challenge of a lifetime. How does one steal a family's history, their very name? Peter Holstein, given his family's German blood, writes his popular series of adventure novels under a pen name. With European politics boiling and his own neighbors suspicious of him, Peter debates whether it might be best to change his name for good. When Rosemary shows up at his door pretending to be a historian and offering to help him trace his family history, his question might be answered. But as the two work together and Rosemary sees his gracious reaction to his neighbors' scornful attacks, she wonders if her assignment is going down the wrong path. Is it too late to help him prove that he's more than his name?